I've been playing with Heroku (a platform as a service) and Mojolicious, which works very well if all of the modules install. Greg Hinkle shows you how to do it. Create your mojo app and deploy it easily to Heroku. As you do, it's dependencies are installed for you. Pure Perl modules are usually fine, but Heroku is a limited Ubuntu environment that doesn't have all the libraries you probably expect to already be there. One of the modules I needed had DB_File as a deep dependency, so deploying my app (with Heroku toolbelt and Mojolicious::Command::deploy::heroku) fails. 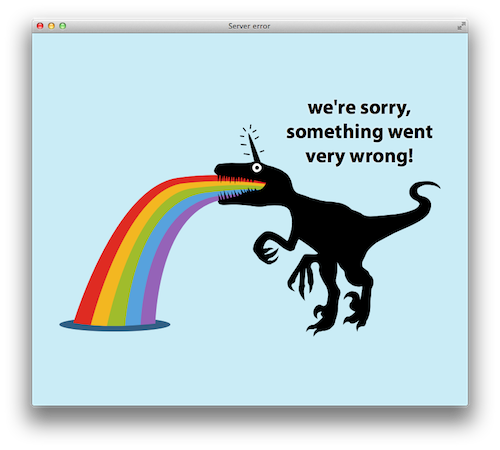 I get the rainbow barf from the uni-raptor. Being new to Heroku, I didn't know how to diagnose this problem remotely and it took me a couple of hours of reading and experimenting before I ran across the various obvious heroku run which allows me to talk to the my Heroku console.
! Installing DB_File failed. See /app/.cpanm/build.log for details. This isn't a huge deal. I can compile DB_File locally and include the result in my app, but now I know that's what I need to do.